There are dozens of titles that honor different moments in African American history in the form of picture books. Here are a couple that I’ve had the pleasure of recently re-reading. 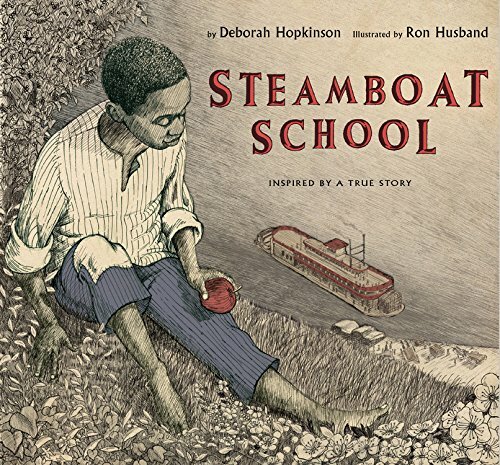 Steamboat School by Deborah Hopkinson tells the story of James, a young African American boy living in Missouri. He was reluctant to go to school, and didn’t like having to learn in the basement with the other African American children. He grew to love his time at school and his teacher, Reverand John taught him about hard work and the history of slavery as well as the regular subjects. In 1847 Missouri passed a law stating that no negroes or mulatoes in the state were allowed to learn to read or write. Thankfully, the cunning Reverend found away around the law. He bought a delapitated steamboat and with the help of his former students rebuilt and refurbished the boat. Once it was complete they would float away from the shore, onto the Mississippi River to learn. This beautiful picture book is a fictional work inspired by the story of Reverend Berry Meachum. He was born into slavery, he was able to purchase his own freedom in 1815. His wife was still enslaved so he followed her to St. Louis and worked as a carpenter, cooper and any other jobs that he could find until he could afford to buy her back. The earth-toned cross hatched illustrations aptly set the mood and are a perfect match to the simply stated yet compelling story of the lengths that people will go to for the freedom to learn. Jacqueline Woodson‘s Show Way was Newbery Honor Book and is one of my all-time favorite Children’s books. The narrative is the author’s bedtime story to her own daughter, Toshi. On page one we hear of Soonie, Toshi’s great-grandma. She was sold from the plantation that she lived on with her parents and was sent to live in another state. Her ma gave her some muslin and two needles and thread syed from a chokecherry tree. An elderly woman who told Soonie’s great-grandma stories also taught her to sew. She learned that the picture they were sewing of stars and moon and roads was a map. Years later Soonie’s great-grandma married and had her own baby, Mathis May who she also taught to sew. When Mathis May was seven she was also taken away but she had pieces of her mama’s blanket and then she continued to sew too. We learn of each generation of woman and how they become more independent and strong and it is greatly because of the strength, courage and love of their ancestors. The story is told with Woodson’s singular poetic word choice which is song-like in beauty and yet effortlessly flows. The illustrations are equally as impressive with a mix of mediums used, including old new clippings. The vibrant colors, water-color skies and paper-cut sunshine give readers new treats to find on every reading. *I love comments! What other titles would you like to see included in this segment over the coming months? Previous If You Haven’t Seen “This is Us,” You’re Missing Out On An American Television Phenomenon.